2012 is already well underway, and I am delighted to share with you a range of PROFESSIONAL DEVELOPMENT opportunities designed to support, resource and inspire you in your teaching this year. A reminder also that DAN happily will post details of EMPLOYMENT OPPORTUNITIES (for Teachers of RE, Values & Philosophy) on our website and e-newsletter free of charge for our members. All you need to do is contact the EO with the Job Ad or link to your school website Employment section. Overcoming the credibility gap is one of the biggest challenges facing Religious Education teachers today. Many of our students tend to be suspicious of religion, and think religious concepts, language and the claims made in religious texts are irrelevant to their lives. If we are to help our students encounter the deep truths that lie within religious traditions and texts, we need to meet these challenges head-on. This full day workshop will explore ways of making religious concepts accessible and meaningful to students. It will offer powerful curriculum tools, pedagogical techniques and model units of work that are academically rigorous and existentially relevant to the deep concerns of our students, and facilitate opportunities for participants to develop units of work together. This is an important workshop for teachers, Chaplains and of particular relevance to those looking to develop interesting and rigorous RE programs for students in years 7-10. 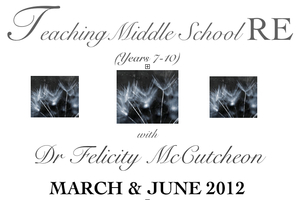 Dr Felicity McCutcheon is currently Head of Philosophy and Religious Studies at Melbourne Grammar School. She has a First Class degree in Religious Studies from London University and a PhD in Philosophy from University of New South Wales. She has lectured in Philosophy at the major Sydney universities, spent a year in Oxford as a Visiting Fellow and is a published author. Her love of teaching led Felicity into school education in 1997 where she has worked to develop a more rigorous approach to philosophy, ethics, religion and values education. Felicity has been a keynote speaker at various national conferences, worked for 2 years across Australasia as a Religious and Values Education consultant, and for 5 years was course coordinator for the Charles Sturt Graduate Certificate in Religious and Values Education. check out the What's On page of the DAN website. Member passwords to access teaching resources on the DAN website will change on 1 March 2012. New passwords will be advised when your 2012 membership is renewed. If you do not know your password, or encounter any difficulties accessing resources, please contact the DAN EO. Please note: There is no member section on the DAN website. However, when you try to access certain documents (most of which are filed under RESOURCES), you will be prompted for a password.